Hurricane Hutch''s Top 10 Ships of the Clyde is an 'insiders' look at 35 years on the Clyde - Captain Robin Hutchison was one of the longest serving and most experienced Masters to serve on the Clyde. He uses his experience, wit and eye for detail to tell the story of his favourite ships and the people he sailed with. It's a book of insight and humour that should appeal both to people interested in what was a Golden Era on the Clyde as well as to 'Steamer' enthusiasts. 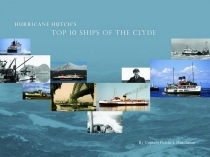 The book features iconic Clyde ships such as the Jeanie Deans, the Waverley, the Queen Mary II, the Talisman and the Glen Sannox, as wellas the luxury cruise ship the Hebridean Princess (only recently awarded the Royal Warrant as the de facto replacement to the Royal YachtBritannia).